You’ll typically see Default and Cancel buttons used together in a window or dialog, to provide OK / Cancel functionality. The idea is that if the user presses the ENTER key, the button marked with the IsDefault property receives a Click event, as if the user had clicked on the OK button. 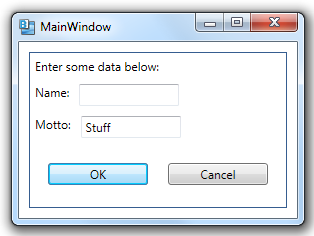 The data that the user entered in the dialog is accepted and the window disappears. If the user presses the ESC (Escape) button, the button marked with the IsCancel property receives a Click event, as if the user had clicked on the Cancel button. The data that the user entered in the dialog is abandoned (not saved) and the window disappears.